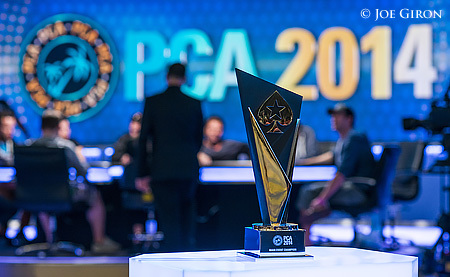 PCA Main Event: 234 Players Through to Day 3! Tags: 2014 pca main event, John Dibella, Liv Boeree, Marcel Luske, Pascal Lefrancois, Vanessa Selbst. Posted on Friday, January 10, 2014 by "T". There are 234 of 1031 players remaining in the PokerStars Caribbean Adventure main event after Day 1A and B and Day 2. The current chip leader is Pascal Lefrancois with 412,000 chips. The French-Canadian pro won a World Series of Poker bracelet in 2010 and finished 11th in the main event the same year. It will be interesting to follow him on the leader board during Day 3! Another notable player among the chip leaders is New Yorker John Dibella with 293,600 chips. Dibella won the 2012 PCA Main Event for almost $1.8 million after a heads-up deal with Kyle Julius! Here are few other big names that will return to the poker tables today: Dario Minieri (168,500), Humberto Brenes (39,000), Vanessa Selbst (251,100), Jason Mercier (438,000), Marcel Luske (134,600), Liv Boeree (135,700). The total prize pool is $10,070,000 and the money bubble will burst when 151 players remain. A minimum cash is worth $17,600 and each player on the final table is guaranteed $173,220; the winner of the whole thing will walk away $1.8 million richer! 7 comments for "PCA Main Event: 234 Players Through to Day 3! " Gogog the poker girls are still into the match, I hope they continue I reach the final table and wins, this would be a nice change to poker scenes, having women playing poker professionally, cheers will keep watching! Yes man you are right. I belive In Vanessa Selbst she is soo good player. Some big names left but as usual it would take a mad man to bet on the outcome. Not too far off the bubble, so the next day should see some minor cashes if nothing else. Be nice to Luske do well. He's a cool dutch cat and hasn't done anything major in a while.